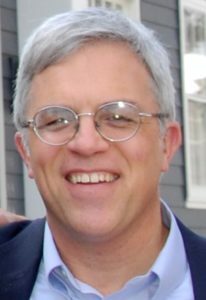 As Supervisory Curator, Mr. Eberhardt oversees the work of the Museum staff and provides a program of changing exhibitions in the 3000 square foot special exhibitions gallery. 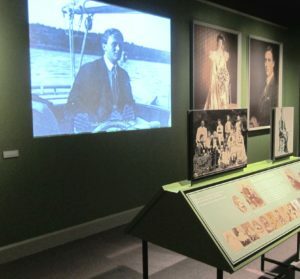 At the FDRLM he began a program of changing special exhibits in a new special exhibitions gallery that was created in 2003 and initiated the first traveling exhibits in the Museum’s history. His exhibition work at the FDRLM has been honored with two Special Achievement Awards from the Archivist of the United States. 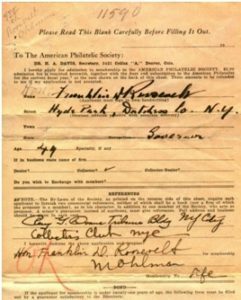 Further to this, when Governor Roosevelt began his initial presidential bid George Linn, publisher of Linn’s Weekly Stamp News, joined forces with the American Philatelic Society (APS) and were led by Roosevelt campaign manager James A. Farley, on a nationwide promotion titled “A Stamp Collector for President.” Between Linn’s efforts and those of the APS, various philatelic items were produced to encourage collectors and non-collectors alike to vote for the philatelic candidate from Hyde Park. 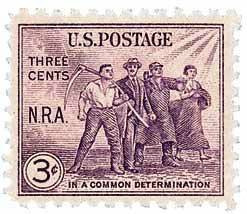 1933 National Recovery Act stamp, issued to promote one of FDR’s first New Deal programs. 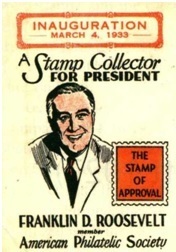 Even after becoming president, Roosevelt remained a “stamp collector’s stamp collector” playing an active role, along with newly appointed Postmaster General James A. Farley, in the issuance of many regular and commemorative postage stamps during his four terms in the nation’s highest office. Farley often consulted Roosevelt for ideas regarding the issuance of postage stamps during his Presidency. As keynote speaker for the Celebration Dinner Mr. Eberhardt plans to give those in attendance a visual tour of the FDRLM, the nation’s first Presidential Library dedicated by President Roosevelt himself in 1941 , with a view of some rare items from the FDRLM collection. Make plans to join us today, reservation and schedule information can be found on the APS website here. The deadline for reservations for the Celebration Dinner is October 19. We hope to see you there as we celebrate 50 years of research and resources at the APRL. their readers, ie, solutions to problems. Staying active is method to talked about on Youtube.